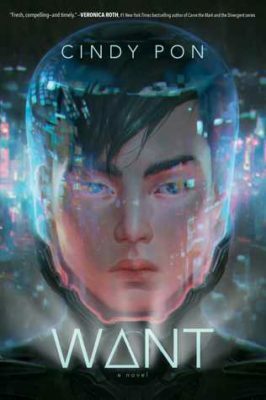 Read a full summary of Want by Cindy Pon. This page is full of spoilers, so beware! If you are wondering what happened in Want, the first book in this series, then you are in the right place! Zhou kidnaps a girl from the streets of Taipei to ask her family for a ransom. He sneaks her away to his solitary mountain home until they pay up. The girl, Daiyu, asks him to take her outside because she’s never been out in nature without her full protective suit and helmet. She savors it as well as the fresh tomato she eats from his garden. Her parents pay up, and soon Zhou drugs her, including a sleeping potion and a memory wipe, before taking her home. Zhou and his friends will use the huge payout to purchase suits to try to infiltrate the richest of the rich and determine how to solve the environmental issues plaguing their society. 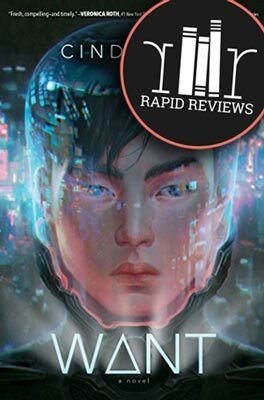 Two months ago: Zhou goes to a meeting with his crew where he discovers Dr. Nataraj feels her life has been threatened twice recently. She’s a professor at a local university, Arun’s actual mother, and a stand-in mother to the rest of them: Zhou, Victor, Lingyi, and Iris. Dr. Nataraj feels her life has been threatened twice recently. They vow to protect her. Zhou soon gets a call from his friend Arun, Dr. Nataraj’s genius son, asking him to help search for her because she’s not returning his calls. They find her dead in her office on the college campus with her epi pins nearby, the liquid tinged brown even though they hadn’t expired. They notice the television remote in her hand and finally turn to watch what’s playing in the background. It’s an interview she did the previous day saying she knows someone’s blocking the environmental legislation she’s trying to propose. She threatens to expose whoever is behind it. The team reassembles and vows to make the perpetrator pay. Lingyi has intercepted a phone conversation that leads them to believe Jin Corp, the monstrous company that manufacturers the environmental suits, is behind the murders. They decide to take this company’s main suit assembly plant in Taipei down and make the rich live either constantly indoors or without their suits. Their original plan (for Victor to be the one to infiltrate the ranks) is not going to work. Zhou volunteers to go undercover instead. They all initially think this is a bad idea because a likeness of him is on a wanted poster after the kidnapping. He has no idea who could’ve put it out there because no one saw him and he wiped Daiyu’s memory before returning her home. They finally agree to let him give it a try. The group spends the next weeks preparing. They get the suit made, have a custom wardrobe designed, and buy lots of custom electronics for Zhou. Zhou works out to put on 15 pounds of muscle. They set up a false identity saying he’s a university kid from America. They think he will be the new boy toy of the rich girls. They gather to launch the initiative, and Lingyi flashes up a picture of the Jin Corp boss’s daughter. Zhou cannot believe it is Daiyu. He panics and tells them this was the girl he kidnapped. They know he’s changed enough that she would never recognize him anyway. And Victor assures him the memory sweep never fails. She will not remember her kidnapper. Arun calls Zhou to his lab to show him how monkeys are still dying from the virus he’s exposing them to despite his attempts to create an antidote. Zhou has one last night out for dinner with his real friends before he goes undercover. Then he attends his first party with the yous on New Year’s Eve. He goes in under his American name Jason and keeps his surname Zhou, which is very common in Taipei. He will never get used to the opulence and waste of the rich. He stands on the sidelines for quite a while before glimpsing Daiyu across the room. Zhou loses Daiyu as he makes his way over and bumps into her friend. He recognizes her from the night of the kidnapping. The two dance, and soon she whisks him off to a bar in a quieter area to talk. She likes him and isn’t afraid to say so. Daiyu approaches and shows no recognition of Zhou. After a short conversation, she leaves. Her friend can tell she likes Zhou and doesn’t seem the least bit jealous about it. Zhou climbs the new rock wall installed in his super plush new apartment on the 68th floor of the Jin Corp building. The bellman buzzes someone up. Daiyu is the visitor. They talk for a while, and soon she asks to climb the rock wall. She does great for a beginner and says she’d like to visit again. Zhou says she’s welcome any time. There’s an attraction and some interest on both of their parts. Zhou receives a personalized invitation to the Jin Gala from Daiyu. Victor gets him a tux and a limo for the party. Zhou meets Daiyu’s friends, and then the two of them leave the party so she can give him a tour of the house. They end up in her room where Zhou’s palm begins copying from Daiyu’s. He needs to stay there 15 minutes to get the data. She comes on to him, but he feels like it’s a test of sorts. They end up talking the whole time, and later her friends join them. They head back to the gala shortly after, but not before Joseph, a boy Zhou thinks has a crush on Daiyu, tells him to stay away from her. Jin Corp has a big announcement to make. Zhou is out in the square with the rest of the yous and meis to hear what it is. Mr. Jin and Daiyu walk out and announce the company is making a more affordable version of the environmental suit for the common people to buy. It was Daiyu’s idea. As people are clearing out of the square, a man who Zhou noticed was coughing earlier collapses. Everyone runs away in a panic, not wanting to catch whatever he has. But Zhou stays with the man, calls an ambulance, and gives them his cash card to pay for his treatment. While Zhou’s helping the man, Daiyu calls and invites him for the private tour of Jin Corp. He’s glad she followed through with her promise so he didn’t have to bring it up again. When Daiyu arrives at his house the next morning, Zhou convinces her to ditch her guards and fly to the company on his airped. She reluctantly agrees. She wants to go in a back entrance, and they are confronted by mei muggers as they make their way down an alley. Daiyu wants to use her taser, but Zhou knows it could kill them. He doesn’t want her to have that on her conscience, so he flings a knife to stop their attackers instead. Zhou asks why she carries a taser, and Daiyu says it’s because she was attacked several months ago. Guilt washes over him. Daiyu asks if he always carries knives. Zhou says he was a knife throwing champion at Berkley, so he has to silently comm Lingyi to make sure she ads doctored stories to confirm this fact. They decide to skip the tour that day because of the stress and do something fun instead. A phone call wakes Zhou the next morning. He’s sick, and his friends tell him that man he helped had pneumonia and a harsh, contagious strain of the flu. Zhou apparently caught it as he was helping the man. Lingyi tells him during her research she discovered that man was planted at the rally by Jin Corp. They’re trying to infect people to scare others into buying their new tapered down suit. Zhou is delirious in fever for several days, dreaming that Daiyu is there taking care of him. When the fever finally breaks, he discovers it wasn’t a dream. She’s been acting as nurse while he was sick. Zhou is worried he gave something away in fevered rambles, but she acts like everything is fine. He accepts a call from Lingyi once, and Daiyu is suspicious he has a girlfriend. But she doesn’t nag about it and continues to spend the next few days making sure he’s okay, even bringing her homework to work on at his house as she watches over him. Once he’s better, they finally go to Jin Corp for his tour. Daiyu asks Zhou to leave his helmet tinted and sneaks him in under an assumed name, saying he’s doing a school project with her. With no suspicions, she shows him everything throughout the building, labs included. She doesn’t hide the eight-digit code as she types it in, so he can confirm what was swiped from her Vox. On the second try, he copies the frequencies of her brain waves as she uses them to access the most restricted areas. After the tour, Daiyu tries to hug him goodbye and is disappointed when he dodges it. Zhou is scared because he feels like he’s getting too close and is trying to stop the feelings that are developing. A week later, the flu strain is rampant and a couple dozen people have died. The group decides Zhou has to go in now using the codes and brain wave access to try to find a strain of the flu so Arun can work on a vaccination or cure. It all goes smoothly at first with the code and brainwaves working. Then Joseph, the boy from the party who he suspected liked Daiyu, confronts him after he’s swiped a sample from the lab. Daiyu calls to let Zhou know Joseph has come down with the flu. Zhou knows it’s from the vial he tried to take from him at the lab the other night. They live in the same building, so Zhou goes to try to check on him. But soon the whole family is gone. And there is no information about Joseph’s illness on the news. Jin must’ve wiped it. Victor and Zhou go to break into one of Jin’s off-campus labs with a closed-circuit computer system. Lingyi thinks they’ll need to be in close proximity to access data from the computers, so they’ll need to get into the building. Victor ends up playing drunk and swiping a key from a guard to make a quick digital scan of it. Iris and Zhou go back and scale the wall with hand and foot holds and use the copied keys to get in. Lingyi is able to run her doppelgänger program and get into Jin’s system. They have to fight several guards as they’re leaving. Iris injects them all with memory wipe before they leave. Lingyi spends the next two days observing and infiltrating the Jin system and is confident their plan will work. If they blow the main building, the backup servers in the facility they broke into will kick in. And she’ll have full access through that back door. During a group meeting, she advises Zhou to cool things off with Daiyu now that they have what they need from her. Victor objects, and it gets awkward because he seems to be talking about Lingyi breaking up with him. Then he blows it off and says Zhou knows what he’s doing. But Zhou isn’t sure and doesn’t answer Daiyu’s texts the next few days. But he misses her. Zhou gets a message from Arun to come to headquarters immediately. He arrives to see that Iris and Lingyi have caught the flu and are deathly ill. Victor arrives, too, and they don’t want to expose him. They finally let him in, though. Arun has a new antidote but is afraid to use it because of how the others have gone, killing his monkeys in a horrible way. Victor convinces him that he must try it since the flu mortality rate is 80 percent. Zhou nurses the girls since he’s immune from already having the flu. They slowly recover. Since the antidote worked, they decide they need to distribute it in the city. They know the government will never approve it, so they will have to do it on the black market themselves. Zhou wants to help, but at first they’re afraid he’ll be recognized. They finally decide if he’s wearing a hazmat suit, then he can help, too. When Zhou finally gets to go back to his apartment, Daiyu shows up. It’s been two weeks since they’ve seen each other, and he’s avoided many of her texts. She knows he’s been avoiding her but doesn’t ask about it. Instead, she asks why she recognizes him. To try to divert her attention, Jason kisses her. But he’s afraid they’re getting too carried away, so he pulls away. The three guys begin distributing the antidote at the various warehouses where sick meis are quarantined throughout the city. Rumors and speculation quickly spread on the undernet about what they’re doing. Jin’s men show up at one of the locations, and a fight ensues. Zhou is captured, but his friends escape. He awakes somewhere in Jin Corp.
Jin himself comes to question Zhou and eventually recognizes him as his daughter’s kidnapper. He tells his thugs to hold Zhou one more night. He’ll question him in the morning, and then they can kill him. Daiyu rescues him. But Zhou’s team has already set the plans in motion to blow Jin Corp. They only have minutes to escape by the time Daiyu finds him. Small blows are already rocking the building. They run into Iris in the hall. She was searching for Zhou as Victor blew the place. The three of the barely make it out before it blows. Victor doesn’t survive. Zhou goes with Daiyu that night. She takes him to the domed theater she’s built for her senior project. She shows him the films she made to show Taipei and the calla lily fields as they used to be. She tells him how she knew about him. The suit she was wearing the day he kidnapped her was a test suit which did video and voice recordings of the goings on around her. The video feed was fuzzy, but his voice was crystal clear. Zhou talked the whole time he carried her back down from the mountain, telling his background and basically his whole life story. And even though she was passed out from the drugs, the suit’s recording device caught it all. And the video feed is how they got the distorted image of him for the wanted posters. Daiyu recognized his voice at the party that very first night. She knew it was him for sure when she came to his apartment that next morning and heard clearly it away from the noise of the crowd. She had been worried about her father’s dealings for a long time but researched it further after the kidnapping and then especially after Zhou asked for a Jin Corp tour. She knew all along her kidnapper had some sort of goal, and the company must be tied to it if he wanted a tour. Then she discovered they were using her access code to tap into company servers. Jin is in trouble for many things, bribery and coercion among them, so he skips the country and heads for Beijing. Arun tells Zhou that Lingyi is the one who leaked the tips on Jin to the authorities. In the wake of the bombing of his Taipei facility, Jin is building a new suit plant outside of Beijing. He promises to manufacture suits for every price point. Daiyu’s senior project is now opened under the name Old Taipei Theatre and is a huge success. Many wealthy in Taipei are now lobbying for environmental legislation to reduce pollution in Taiwan. Daiyu is at the helm of this campaign. And Arun’s antidote helped stop the spread of the harsh flu strain. Zhou still hasn’t assembled with his friends since Victor’s death. He’s not quite ready yet. Zhou and Daiyu are happy together in their new relationship. They hope to change the world together. There you go! That’s what happened in Want, the first book in this series. Ready to own Want? (And hopefully Ruse will be available for pre-order soon!) Click to buy and help us pay for hosting. Oh and share this with your friends who might like to read a recap of Want.